Luxury apartment next to the ocean! Apartment in Lanzarote - Once You've Felt The Silence And The Beauty You Want To Stay For Ever! Casa Esquina del Mar is a very luxury and romantic apartment on the first floor, the perfect place for 2 persons and next to the ocean with an official touristic license Viviendas Vacacionales (VV-35-3-0000400). Your guarantee of a carefree holiday! On the sunny Canarian island of Lanzarote, free from the stress of mass tourism, with a clear wind providing the island with the most healthy biosphere. 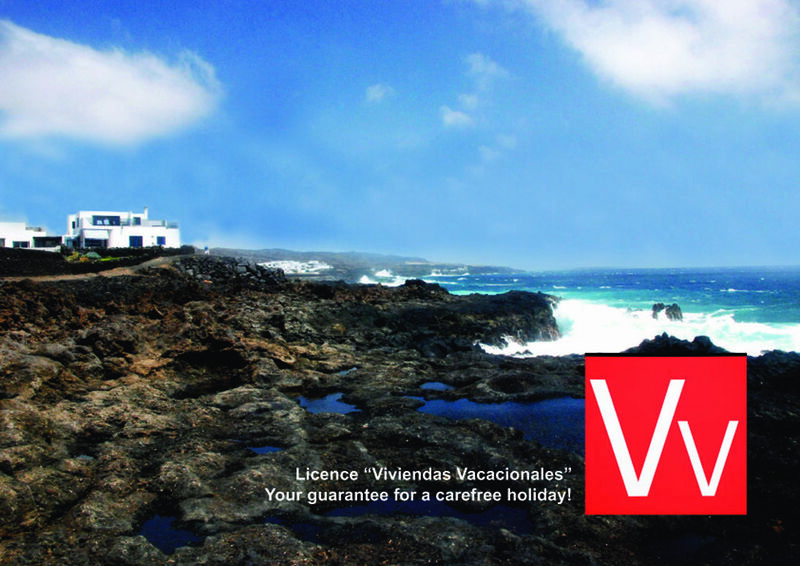 Unesco declared Lanzarote a Biosphere Reserve in 1993. In the morning you can witness a beautiful sun-drenched sunset while enjoying breakfast on the spacious terrace with a wide view on the bright blue ocean, the ancient salt mines and the contours of the hundreds of palm trees surrounding the village. Within walking distance of (the apartment) Casa Esquina del Mar there is a private hideout near the water where you can take a dive in the ocean and also very close is the private beach with a natural ocean pool. You like fishing... no problem just in front of the house is a very nice place and only a few minutes away (car) there’s the marvellous Costa Teguise Golf. This unique and peaceful location of Casa Esquina del Mar provides the privacy for naked sunbathing. A holiday, an island, a house you will never forget! The famous Costa Teguise golf course is only few min drive away! Notes on accommodation: The luxurious apartment with all modern conveniences has an open structure. Outside: The apartment has a fully sun orientated sun terrace, with own private heated jacuzzi. The well-equipped and comfortable apartment has everything needed for a great stay in Lanzarote. Away from the tourist hustle and bustle, it is still within a few minutes easy drive of Costa Teguise with its many restaurants, and also ideally placed for visiting attractions in the north of the island (those in the south are also no trouble to get to as Lanzarote is so small and the roads so good). There are some fine costal walks right on the doorstep. The apartment has a comfy bed, great shower, and the kitchen is equipped with everything needed. The large picture windows on either wide offer drmatic unspolit views of the Atlantic. It is difficult to imagine a porperty with a better sea view. The large wrap around balcony (complete with hot tub) is ideal for soaking up some sun, and being on two sides allows (for most of the time) a chance to escape the all-too regular wind. But just watching the waves crash on the mini Los Hervideros right in front of the balcony is theraputic in itself. This is a place ideally suited to those wanting to switch off in comfort away from the crowds. Nos alojamos en casa Salinas de mar, cerca de casa Esquina del mar, en Los Cocoteros. Es la segunda vez que estamos en una casa de Filip y Carine: en julio de 2015 estuvimos en casa Caleta de Famara. En las dos ocasiones hemos estado fantasticamente bien. Las casas estan bien cuidadas y limpias, en sitios agradables y con espacios exteriores donde disfrutar de las vistas y las puestas de sol. Casa Salinas de Mar esta bien equipada: cocina completa, lavadora y lavavajillas, ducha jacuzzi, dos habitaciones con buenos colchones. Se proveen toallas y albornoces, nuevos y limpios, y toallas de playa. Ademas, te recogen en el aeropuerto y te acompanan hasta casa. A very quiet and peaceful location where the only sound is the waves crashing on the rocks. The apartment was clean and comfortable. The hot tub on the balcony was amazing! Would definitely recommend. This apartment is perfect for a quiet relaxing holiday in the wonderful Canarian sun. This really is a luxury villa with all you will need. The village is small and quiet but has a well stocked local shop. This is the perfect base to explore Lanzarote from with Costa Teguise only a 10 minute drive away and to the north some amazing less touristy spots. An amazing apartment with first class hosts for you to do as little or as much as you like. Have just spent a wonderful week at this lovely rooftop apartment overlooking the ocean, with balconies on two sides incorporating a useful windbreak of a wall (even while still able to view the sea) and a luxurious hot tub. Although the village has few amenities, for those wanting to get away from it all, it's a perfectly peaceful spot except for the exciting pounding of the surf just below the apartment. One of the advantages of this holiday was being met at the airport by our friendly, welcoming hosts, who had also arranged the booking of a hire car for us. On arrival at the apartment we were also surprised and delighted to see a bottle of cold Cava waiting for us. On two evenings we also enjoyed delicious meals cooked by our host and brought up to us in the apartment. Highly recommend. Wellness, paramedical- and endermology treatments (anti-cellulitis "LPG" treatments) in combination with your stay available. The apartment is situated only 5 metres away from the ocean, 300m away you can swim in the ocean in the Caleta and also very close (250m) there's a natural filling swimming part in the ocean where you can enjoy the ocean without influence of the waves. The airport of Lanzarote is in Arrecife only 20km away, we personally come to welcome you at the airport and can arrange at a very interesting price car hire, delivered at the airport and fully assured. The capital, Arrecife, is only 20 km away, Costa Teguise takes a 15 min drive and a lot of interesting places to vistit are only 20 min drive away. Changeover Day: The changeover day is flexible. Your resort is always available ultimately at 2 pm the day of arrival and has to be free at 9 am the day of departure.